This unique medium is both beautiful and versatile. Various techniques and methods include layering, molding, scraping, carving, embedding and pouring. The process of working with encaustic is unlimited. Encaustic painting can be traced back to about 100 AD in the Egyptian Fayum mummy works. Diego Rivera and Jasper Johns are more contemporary artists known to have worked with encaustic. Encaustic is paint composed of beeswax, dammar gum resin and pigment. The resin is derived from the Dipterocarpus tree. The tree resin is what is used to make varnish when mixed with turpentine. The wax mixture is kept fluid by heating it during preparation and painting. The word encaustic is derived from the Greek word enkaiein, meaning to burn in. The process of painting in encaustic requires the fusing of each consecutive layer. Encaustic medium typically consists of an 85/15 ratio of beeswax to dammar resin. The medium is melted down in a crock-pot or other designated pot at a medium temperature until the resin and wax have both dissolved. This ratio can be altered according to the desired consistency. The more wax, the softer the medium. Increasing the dammar resin ratio will result in a stronger more shellacked effect. Oil paint, oil sticks or dry powder pigments may be added to the medium to create the desired color palette. Depending on the color choice and quantity, the encaustic paint will range from transparent to opaque. The paint is mixed in heat resistant containers. It is kept molten on a heated surface such as a pancake griddle around 150 °. Applying the paint may be done in various methods. The wax mixture may be poured, dripped or brushed on. Natural bristle brushes are a good choice. Each layer of wax needs to be fused to the prior layer in order to adhere. When the wax is completely cooled the surface may be buffed with a cotton cloth to a glossy shine. Encaustic can be a very processed based medium. It is good to experiment with various tools when working with the paint. Image transferring can be done on the wax with drawings or laser images. 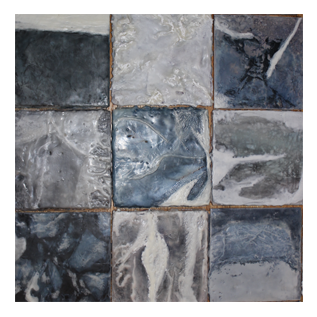 The texture of encaustic lends to a more sculptural medium providing dimensional possibilities. The wax can be carved into allowing for marks to be filled with an additional pigmented wax. Various found objects may be embedded into the composition creating collaged assemblage works. Appliances and tools for heating consist of a crock pot for heating the medium, smaller containers for mixing pigment with the medium, and a heating surface such as a pancake griddle. 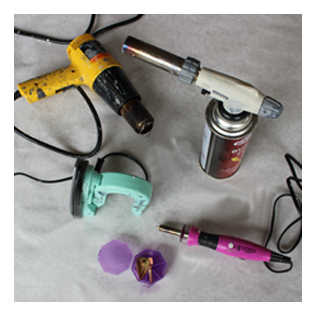 Possible heating tool used in fusing the wax are a heat gun, creme brulee torch, heating stylus, and encaustic iron. Always fuse on a fire resistant surface such as a stainless steel table. Scraping tools such as ceramic and wax tools help to create shapes, textures and patterns. Brushes can be used just as in traditional oil painting, creating various textures from smooth to a more scumbled effect. 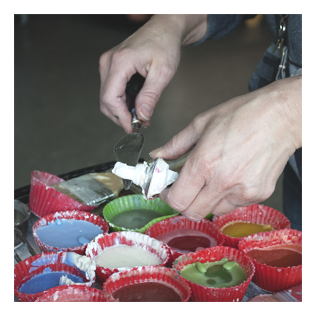 Palette knives are great for lifting, and cutting into the wax. Wood is the ideal substrate for applying encaustic onto. It is best to use a cradled panel for paintings otherwise the wood may warp. Wood floor panels work well for test pieces. Other materials may be experimented with, such as heavy papers, ceramics or anything that will withstand the fusing process. Stay away from flexible materials such as canvas and cloth as the wax will crack and peel with the movement of the fabric.